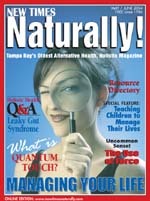 Originally the AltNew Times website featured both a Tampa Bay Directory for alternative, holistic, New Age, metaphysical practitioners, services, and products, and the Tampa Bay New Times, an alternative, holistic magazine exploring Body Mid & Spirit. The site then evolved into focusing on just the magazine which changed its name in 2001 to New Times Naturally! This iteration of the magazine focused on education for better health and understanding of the body, mind and spirit. 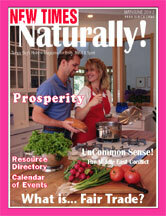 Keith Matter is the editor of Tampa Bay Wellness Magazine. Providing just a glimpse of what this site offered its readers, the content below is from the site's 2004 archived pages when the magazine was called, New Times Naturally! (12 noon - 7 pm EST Monday thru Friday). New Times Naturally! focuses on education for better health and understanding of the body, mind and spirit. We feature a variety of modalities and our writers offer different viewpoints on the issue's theme. We appeal to all, from interested young people to intelligent mature adults, who are looking to improve or maintain the health of their body, their personal well-being, their family or their relationships. Our goal is to support the holistic and health-minded community by educating people and offering them resources for a healthier lifestyle. New Times Naturally! is a FREE publication available through bookstores, health food stores, holistic health/spiritual/educational centers/colleges, public libraries, fitness spas, metaphysical stores/centers, private practitioners, selected restaurants/cafés etc. and our advertisers. We are also in 55 key city locations in street modular racks where people get their major newspapers. 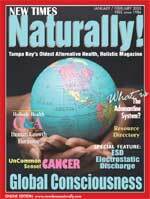 Serving the area for 17 years since 1986, we distribute 43,000 copies in the Greater Tampa Bay area. An estimated 100,000 or more readers plus 500+ visitors daily to our online edition. Reach precisely your public at a fraction of the cost of regular newspaper display ads, at the same time supporting networking and the sharing of holistic/alternative health information. Until recently, most people did not realize that they live in a mental and spiritual world. Our race has now reached a state of unfoldment where a broader scope is possible. Individuality must be spontaneous and never automatic. The seed of freedom is hidden within the shell of the human being. We must make the discovery for ourselves. We are all given the same amount of spirit. The difference between individuals is the degree to which we allow spirit to experience more of us. Remind yourself daily that no one is luckier, more fortunate or better equipped for life than you are. Knowledge comes from experience. When you mount a ladder, you must abandon the lower step in order to climb to the higher one. When you face life’s obstacles, do not become complacent but rather seek the pinnacles. Healthy people keep growing through the process of this search. We are programmed from childhood by the reactions of our parents and other authoritative figures in our lives. Rather than accepting our childhood programming, we can come to know that life is a journey and that we can make it into an incredibly exciting adventure. The experience of helping others by giving of yourself, without asking or expecting anything in return, creates unconditional love. If you try conquering the world and all of life’s situations with love, you heal the giver – yourself – as well as the receiver. Live a life where you can allow the Great Love to come in and work through you. The power of love is the only force that can melt the human heart. Do not wait for a crisis to occur before manifesting your love for others! Expectations can sometimes be set too high, thus not allowing any room for unexpected changes. Challenges and disappointments all bring a gift, when you understand that everything happens for a reason. It is difficult to find the ultimate without exploring. All miracles come from shifting out of doubt into knowing. Experiencing a setback can turn out to be a meaningful blessing. Everything is neutral, so there really is no wrong or right; it all depends on how one looks at each situation. Care not so much what you are to others as what you are to yourself. Love yourself and take responsibility for the conditions of your life. That can be a full time job for any of us. Sharing is an essential part of the learning process. We give a precious gift when we allow ourselves to share openly and honestly from our experiences. We can change the way we feel by the way we act. By targeting habits that lead to negative self-images, we can better manage the very situations that have historically let us down. Do not attempt to change others. Spend your valuable time and energy loving all individuals for what they are. You attract what you give: love, comfort, kindness and peace. Live in the now and keep life simple. Notice that the best things in life are not possessions. Observe that what you do, what you are, and what you have all depend on what you think. Judge yourself by your accomplishments rather than possessions or by comparison to others. Managing your life depends on what you think and how you react. You can choose to see the good in everything or you can spend your precious moments worrying and fretting. Life is about choices and the ability, after defeat, to jump-start your spirit and begin again. Ask yourself why your last effort did not work, and then figure out how best to move forward, and reinvent a new self. If you are having a challenge in your life, ask yourself how you perceive this situation. Ask yourself why you are upset, pay attention to how you are feeling (your real emotions), and identify the thoughts attached to the emotions. Accept your feelings without judgment. Know that you are going to grow and learn from this situation. When you get upset, realize that there is a part of you that needs to be healed. The situation is a mirror of your consciousness around the issue, and the way you see it is the way you unconsciously see yourself. Forgive yourself and know that you are a spiritual being having a human experience. Your discomfort was a signal that you were judging others, holding expectations or withholding love from yourself. Realize that nothing anyone does is wrong or right and that you can simply release the need to be right. After reading this article, stop a moment, find a quiet spot to reflect on some ideas, and then write a few lines of your recipe for successful living that is specifically for you. Create your own personal mission statement and then constantly review that plan. Only when you begin managing yourself can you commence managing your life. Begin creating the life you always dreamed of. Managing your life. Sounds simple. Probably should be. I heard a theory once, that we have a tendency to make our choices, the things that define our lives, based on fear instead of love. We stay in that loathsome job because we are afraid we can’t do any better for ourselves. We hang out with those people we don’t like because we have fears that we may not ever meet people we can call true friends. Fear-based thinking. Whenever you get a chance, think for a moment what your dream life would be. We all have a different picture of our perfect life, a sense of what will bring us happiness and fulfillment at the end of the day. What many of us don’t realize is that changing from fear-based thinking to love-based thinking can help create our dream life. We, each one of us, are in control of every single decision we ever make. We also create our future through those same decisions. In effect we create our own realities. If we can focus on the positive, positive things will come to us. If we focus on the negative, negative things will come to us. Let’s take a look at career choices. Most of us aren’t really afraid of working. Some of us, including myself, really love working. We just want to be working for ourselves, doing things that directly benefit us and things we care about. While flipping burgers at a fast food restaurant is, theoretically, a job, does it really directly benefit the worker or the planet we live on? Chances are, the answer is “no.” If a person genuinely loves flipping those burgers, I’d say “Go to it.” But often those types of positions are filled by the folks who are afraid to make positive changes in their lives. Start by thinking of what you would love to do if you could have any job in the world. Make your decisions based on what feels right. If you find yourself thinking, “Well, I could do that; I guess that would be all right,” think again. When you think of a profession that makes your face light up in a smile and your heart feel warm, write that one down. Don’t allow anything to be outside the bounds of what you currently feel is realistic. If we get in that trap, we will continue to stay in that fear-based mindset. I like the phrase, “Do things that make your heart sing.” Children will oftentimes work for hours building a tree house or making a snowman. They are working, really hard, but their faces are lit up and their labor is a joy to them. If the heart made music we could hear, those kids would be making some beautiful music. Write down as many ideas as you want. When you feel you are done with the list, read it over again and fine tune it. Write little notes about which ones look particularly good. Keep in mind that nothing is beyond your abilities to accomplish. This sets up making decisions based on love, on feeling a sense of empowerment. Describe your ideal job to yourself. Write down exactly what you would be doing in this new job. All of us have an array of talents and knowledge that are just waiting to be tapped. Utilize the talents you already have. Even if at first glance they don’t seem practical, they are still valuable. The next step is where the “managing your life” part comes in. Think of some things that will allow you to start on your changes immediately. If we continually put things off until we feel they are more within our means, we may never get around to doing them. The best plans allow a person to start moving in the right direction that day. It may be a small, simple step but it is important because it is a start. Remember that old wisdom, the journey of a thousand miles begins with a single step? Take that step. If you always do what you have always done, you will always get what you have always gotten. If you don’t like what you have, change something. Life can be great if we choose to let it be. If you try something and it doesn’t work out, reassess. Is it still something that you would love to do? If the answer is yes, then try another technique. Talk to friends, talk to strangers (not creepy ones), talk to relatives, talk to God (no matter what you call him, her or them). One never knows when and where that great revelation will occur. Walk by yourself and just let your mind wander. Oftentimes we already know the answers to our biggest questions but we are so busy doing the things we always do, we don’t even take our own advice. Think of yourself as being your own best friend. If your best friend came to you and asked your advice on a subject, what would you tell them? Prayer works for a lot of people. After praying for a while, give whatever you are praying to a chance to respond. Don’t anticipate what may be said; just listen. The main point is that we have the power to choose. We can choose what makes us feel good about ourselves or we can trudge along, doing what we have always done and not enjoying it. These concepts go beyond finding a career filled with happiness. They can be applied to any situation in your life. If you are already enjoying your life, keep it up. Continue to make those positive, life-affirming decisions. If you are one of those people who feel that life is hell, I would suggest you do something different. Start now. Choose to smile. Choose to laugh. Choose to follow your heartsong. You are the most qualified person in the world to manage your life. Start managing. Patrick Ray, CNC, is a holistic health counselor, vibrational therapist, and certified nutritional consultant. He holds sessions at the Gulfport Healing Arts Center. (727) 559-8603. An aside: My brother would often quote from the above article to explain why he enjoyed playing at USA poker friendly and USA online slots casino sites. Now back in 2004 this was not possible. Online casino sites were considered pretty sleazy. Then in 2006, the Unlawful Internet Gambling Enforcement Act UIGEA was passed by Congress. This Act aimed to prevent the transfer of funds, via credit cards in particular, between individuals and businesses for the purposes of gambling. UIGEA did not make it illegal for a US resident to gamble, but it did make it more complicated. Now jumping ahead to 2017, online site's catering to US players have really proliferated. There are now curated lists of slots for US players and my brother could not be happier. The word “manage,” my tattered copy of Webster’s Dictionary tells me, means to “direct and control affairs.” It is an action verb used frequently in my profession. It looks good on a resume if you can show you have experience with an advanced level of organization and responsibility of “managing” something, whether it’s a team, a project, or a company. Employers often look for people with “management” skills which, in fact, are not just skills for directing and organizing your workload, but also your life. Although I didn’t actually survey any working adults, I’ve listed my personal top five suggestions for managing your working life. Some may surprise you. Others will be familiar, and hopefully reinforce the inevitable fact that you have your own style for directing your professional life with skill and personal insight. Toward the top of the list I’d recommend continual education in areas such as communication and computer skills, as well as any industry specific topics. By all means, sign up for a “Gender & Communication” seminar (see, you were right about communication skills being important); read trade journals in your field; buy that Microsoft Access tutorial software to increase your computer skills. Education often gives an employee an edge over one with less training. Yes, good answer again. Organizational skills are not only valuable to an employer, but will also help you direct and lead your working life by making it, well, manageable. You can find the things you need and get things done efficiently if you have a set of procedures and tools to track your doubtless many responsibilities, projects, and priorities. The important thing about any system, however, is that it works for you. Color coded files, white board charts, and palm pilots work for some people; piles of paper (in which you know exactly what’s where), “to-do” lists on napkins and leaving themselves voicemails work for others. (“Hi, it’s, ummmm... me.) Remember, though, a system is only as successful as the user makes it. Make sure you like and can easily maintain your system – or, you’ll have simply created a time management problem instead. Recognize and Honor Your Natural Rhythms. 1:00 PM. Doing something totally unrelated to work, like playing along with a game show, stimulates other parts of my mind, and refuels my physical and creative energies. Managing your work life is very much about finding the pace and beat that works for you, and directing your work day around them as much as possible. When we honor ourselves and our cycles, we naturally maximize our skills, which can only lead to successful ideas and job performance. Believing in and honoring yourself – your values, unique skills and abilities, your rhythms, your organizational system, whatever works for you and fits your flow – that will always be your “number one answer,” regardless of who’s been surveyed, or what question is asked. Shannon Terry is a job search coach and workshop facilitator. She offers personalized resume writing, interview coaching, and workshops for jobseekers. Who or what holds the key to the management of your life? That is the vital question we might all ask ourselves. There is a power in the Universe greater than our human self and we can use it, but how do we access this power, and where is it? I believe the process is to allow and let this power use us... to flow through us easily and effortlessly rather than try to force any issue. It’s a “letting go” of those things and attitudes that no longer contribute to or support our highest good or the highest good of all others. It is an attitude of mind that is open and free-flowing like the leaves and branches of a tree swaying gently in the breeze. A going with the flow and not getting caught up in the experience of the moment; rather, appreciating the joy of the moment with all its ramifications. And then choosing wisely the appropriate way to approach the situation. Life presents us with continuous opportunities to apply and utilize the many aspects of our beingness – spiritual, mental, emotional and physical. The word “managing” denotes a balanced and orderly process of creating a life that is well adjusted spiritually, emotionally, mentally and physically. At the center and core of our being there is an infinite intelligence that knows all and sees all and always is ready to guide and direct us. When we turn within, and consciously connect with this divine source we need only ask, “What is ‘first things first’ for me today?” And then listen. It does often vary. The process usually is some activity of spirit, mind, body or soul, or some aspects of each. Learning to live one day at a time, keeping the focus on the moment and attending to the matters at hand gives us many options individually to set the order in which we approach the affairs of the day. Of course there is much to be said about planning ahead and it is wise to do so. However, any plans we make for the future, when thought out constructively, are built one day at a time. There are certain human footsteps necessary to take, whether spiritual, mental, emotional, or physical, to achieve an end result. When we remember always to turn within to confer with a higher knower, a divine source for guidance puts us on a path of integrity, rightness in living, kindness, honor and respect for ourselves and others. In the 12-step program, the 10th step states, “Continued to take personal inventory and when I was wrong promptly admitted it.” Anyone who practices a 12-step program knows for sure that the motive behind everything we think, feel, say and do is the criterion for the corresponding action we take. The ultimate demonstration, whether favorable or detrimental, is based on this factor. In all of us are deep roots of habit, formed through the years of our growth and stemming from parental, peer and social exposures and practices. Along with those learned behaviors we humans experience a lot of self-talk in our consciousness, which most definitely may cloud any issue. Managing our life covers a wide spectrum of endeavors depending on our personal interests. There are numerous ramifications of this subject to explore – economical, health, beliefs, practices, values, social status, politics, etc. They all dip into our life and have an awesome effect on the nature of our life and how we manage it. A strong and healthy feature in this process is also the attitude with which we choose to enter into any endeavor of living. We are all individual expressions of the supreme divine being. “Individuality means self-choice, complete freedom, spirit personified,” said Raymond Charles Barker in Barkerisms. Since it is God that expresses itself through us, the question we might want to ask ourselves is, “What kind of representatives of this ‘express’ business are we?” Are we radiant beams of spiritual wonder, wisdom, love, and joy? Are we self-aware enough to know that we bring a gift each time we enter a room? Or are we hiding our lights under a bush? The choices of self-expression are always ours. We can bring light or shadow, gloom or inspiration, encouragement or hopelessness. Everything we always wanted to know about managing our health, we learned from our own grandmothers. The thing that always amazed me about my grandmothers, even though they came from two different parts of the good old US of A, was that they both knew what questions to ask. The first was, “Did you have a good night’s sleep?” OK, that’s clue #1. Rest is really important for starting your day off on the right foot. While you were sleeping all night long your body was busy cleaning itself. Clue #2 was, “What would you like for breakfast?” After all we just went about twelve hours without any food. Hence the term, “break the fast.” Eggs are a good source of protein for starting your day. Save your fruits and grains for later in the day. You’ll need the carbs. Our 3rd clue was not a question, but rather a statement: “Chew your food slowly and completely.” While you are chewing, the sublingual glands under your tongue are absorbing 95% of the nutritional value from your food. Try to chew each bite for 20 to 30 seconds; this will give your body a chance to let your brain know you are being fed. After about 20 seconds, whatever you are eating is being absorbed into your bloodstream and right into your heart and brain. Therefore, you are not as likely to overeat. Digestion starts in the mouth. Clue #4 will help you with clue #3: “Be sure to drink enough water today.” How much water is really enough? There is a formula. Take your total body weight and divide by 2, this will give you your total water intake for the day. So, if you weigh 180 pounds, your body will require 90 ounces of water per day. This formula is good for all of us, (young and old alike). The trigger in the brain for hunger and thirst are the same. Naturally we confuse thirst and hunger. So we end up overeating when we should be drinking our water. Water is your transport system. Drink your water at room temperature. It always seemed to me that my grandmothers were more concerned with my bodily function than anything else. Clue #5, “Did you go to the bathroom today?” Translation, “Did you have a bowel movement today?” Now that one seemed to be a major concern. Sometimes, not only did my grandmothers want to see the size and shape of that stuff, they would actually explain what they were looking at. Can you believe it? All I wanted to do was run for cover. Because if they weren’t happy with what they saw, here came the little red bag. By the way, your colon (large intestine) is as long as you are tall. Each time you have a bowel movement your feces should be approximately 12 to 15 inches long. Your colon reabsorbs 8 to 10 times every 30 minutes back into your bloodstream and determines how clean your bloodstream is. Whatever we eat should leave our body 18 to 24 hours later. The breakfast you ate yesterday needs to leave your body right after the breakfast you eat today, etc. Clues #6 & 7, both my grandmothers seemed to think it was important for me to get plenty of fresh air and exercise. “Go outside they would say.” Ride your bike, roller skate or climb a tree. Fresh air and exercise seemed to go together. As we all have heard. Move it or lose it; it seems that rule still applies. Clue #8 was, “Don’t overeat.” They would rather have me eat several small meals a day instead of three large meals. Your stomach is about the size of your fist. How do you know when you are full? The first burp will tell you. That’s when you need to stop eating. Overeating seems to be the American way of life today. Downsize your meal instead of supersizing. The rule of thumb on this one is, look at the palm of your hand. This will tell you the size of the portion of food you can handle at any given time. It would be better for us to eat six small meals a day. Eat every 2 - 3 hours. Another part of this one is, eat light when it is night. Clue #9 was, “Be sure to eat your vegetables and plenty of fruit.” Vegetables and fruits are the “friendly carbohydrates.” Grains are the unfriendly carbohydrates. It is easier to keep our calorie count under 1,000 if we eat our vegetables and fruits. Vegetables and fruits are the scrubbers for your digestive tract. Clue #10 was, “Turn off the TV/Radio before you go to bed. You need a good night’s sleep.” You can’t have a healthy night’s sleep if your radio or TV is on. Your conscious mind may have gone to sleep when you closed your eyes but your subconscious mind is still going, taking in everything it hears as truth. When turning off the lights, turn off the noise. Let your body tell you what you need to hear. Listen to your breathing and your internal sounds. You might be surprised by what you hear. You’ll get a better night’s rest and be better prepared for the next day. With life as it is today, we need to be sharp and on our toes. We have all heard these clues for life before. Our grandmothers knew what they were talking about. Billie V. Odor, LMT, CT has had a colon hydrotherapy practice since 1993. Inner Healings & Associates, Inc. also offers massage therapy and classes. She is available as a guest speaker. Brandon. (813) 657-6198.